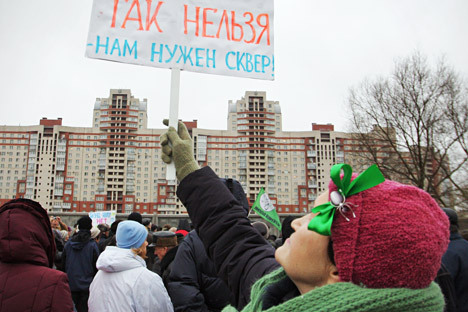 A new type of public association is growing stronger in Russia. Instead of encouraging opposition rallies and stage pickets near court buildings, it focuses on local environments and issues. The district of Pavshino is somewhat of an anomaly in the bustling Moscow metropolis. Its dark narrow streets cut the area into neat squares of private households, and spreading apple trees block the horizon. But all this could soon change – the ongoing construction of modern high-rise apartment buildings casts an ever-worrying shadow over the idyllic Pavshino landscape. These residential units are the scourge of the Pavshino Territorial Public Self-Government (TOS). The TOS is still an exotic form of democracy in Russia, but it is not as helpless as it may seem. What is a TOS organization? Under Russian law, citizens are entitled to create their own territorial bodies of power – most often these are isolated parts of cities, streets, yards and quarters. Such organizations do not have many powers: a Territorial Public Self-Government (TOS) is entitled to represent its founders, engage in commercial activities aimed at developing the area and addressing the domestic problems of local residents, and submit initiatives concerning local issues to deputies. Nonetheless, even these scarce powers were enough for TOS units in some regions to become real political players and sources of trouble for local officials. TOS Pavshino was founded in 2002, when the local residents got tired of the lack of good roads around their households and tried to get the local authorities to repave the streets. “At first, we received meaningless formal replies. But then it turned out that the streets of our village simply did not exist, because not a single government body was responsible for them,” said the organization’s head, Nikolai Zuev. In order to have roads built, the municipal administration suggested that a TOS be established and applications for road repairs be filed on its behalf. Activists gathered the residents and founded a TOS without any opposition from local officials. But the harmonious relationship between the authorities and the people did not last long. “In 2004, we fought for our homes, not for roads. The local authorities had signed an investment contract to build high-rise apartment buildings on our land. The developer was trying to buy our land plots, saying that ‘everything has already been decided.’ But the residents rejected its offers, and it was through the TOS that we had the contract nullified as unlawful,” Zuev said. The TOS has earned a number of victories during its existence, including the development of local infrastructure and the indefinite postponement of redevelopment plans that were not to residents’ liking. The TOS fills the gaps left by the authorities, Pavshino residents say. There is no independent municipal authority in the district, and Moscow authorities fail to take their interests into account. “The authorities don’t hear us, and all of the campaigns of our TOS are designed to have the authorities take the opinion of the local residents into consideration,” said Zuev. TOS organizations – grassroots public associations – have become an instrument for residents to uphold their interests, often in the form of protests. Officially, TOS units can give up the protest model of engagement with the authorities and become real self-governing entities at the lowest tier of the government system. Petr Miloserdov, coordinator of the Council of Municipal Deputies of Moscow, believes TOS organizations have no future, given their current legal status. In Moscow, TOS structures have essentially been turned into one-time tools. For instance, territorial self-governance appeared in Moscow’s Voikovsky district when local residents were struggling against infill construction. “Our main instrument was the official letterhead of the TOS, to which the authorities had to respond,” said Victoria Vasenkova, head of the Nikolskoe TOS. After successfully fighting off developers and officials, the TOS was forgotten about, and its activists stopped reelecting its board. “We boosted our authority, and local executive agencies have to reckon with us; so we try to resolve problems personally. If we fail, we take the case to a court of law,” said Vasenkova, commenting on tactics. The article is abridged and firts published in Russian in the Kommersant-Vlast magazine.